Answer: This week’s list took much longer to compile because of the many typing breaks required to excitedly rub our hands together in giddy pleasure. Finding books that leave our mouth agape are a rare treat and our favorite pastime. We can’t wait to read everyone’s lists and unearth all the other great books that fit this category! The Shadow of the Wind (Carlos Ruiz Zafon) – Something happens to the main character at the very end of this book that had us yelling NOOOOOOO.... Needless to say, we were a little caught up in the suspense. My Sisters Keeper (Jodi Picoult) – A perfectly good vase nearly got broadsided at the conclusion of this one. We’re not head over heels about Mrs. Picoult, but she does know how to deliver suspense. The Pillars of the Earth (Ken Follett) – Instead of a single jaw dropping event at the end, this novel had them strewn throughout. Honestly, we probably need three hands to count the number of “Oh, no he didn’t” moments. The Kite Runner (Khaled Hosseini) – This book didn’t open our lower jaw as much as it did our tear ducts. The final exchange between Amir and Sohrab was so touching. A Pale View of the Hills (Kazuo Ishiguro) – We mentioned in our review that this book did a number on us. It wasn’t spectacular, but the end revelation completely caught us on our heels. Shutter Island (Dennis Lahane) – One of the best physiological thrillers ever! It certainly helped that we read the book before seeing the movie. It took nearly three rereads before we could believe the twist at the end. The Haunting of Hill House (Shirley Jackson) – With any haunted horror novel the reader should expect the unexpected... yet, the tree scene at the very end sent a pleasant chill down our spine. Jude the Obscure (Thomas Hardy) – Overall we had a hard time liking this book. The infamous jaw dropping scene in this novel was appalling and ghastly, yet it happens to fit in this week’s category pretty nicely. Great list! I admit I only skimmed most that I think I may read eventually. I just finished The Thirteenth Tale, and the ending left me completely floored -in a very good way! That twist in Shadow of the Wind was definitely a surprise. He's a character you don't want anything bad to happen to. Great topic this week! I loved #1, 3, 6, &7. And, wow, I had no idea The Beach would make a list like this?! It's on my TBR pile and it looks like I might have to get to that one very soon! I know exactly what you mean about The Kite Runner...what a tearjerker! You've just made me really want to read Jude the Obscure! Shutter Island is such a good jaw dropper, and the end of My Sister's Keeper was jaw dropping, but made me HATE the book entirely. Just, ugh. Oh Bridge to Terabithia. Oh my God. I can't even - that ending just kills me. It's been a good 20 years since I managed to read it, but just thinking of it makes me all teary! 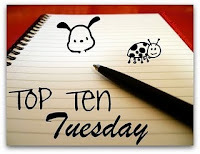 My Top Ten is over here if you'd like to stop by! Happy reading! Shadow if the Wind has been on my radar for awhile, sounds like I need to read it. I haven't read a real jaw dropper in awhile. Pillars of the Earth has been on my shelf but it is just so darn intimidating that I havent read it yet. Although it may have moved up my TBR list a bit.